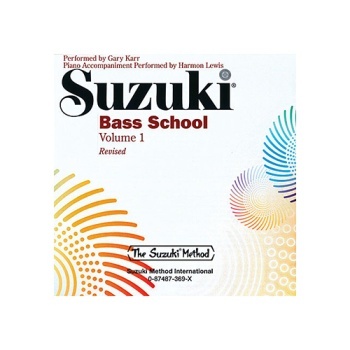 Teach bass with the popular Suzuki Bass School. The CD features an exquisite rendition of the bass part with piano accompaniment. Recordings by Gary Karr. Titles: Twinkle, Twinkle, Little Star: Variations and Theme (Shinichi Suzuki) * Lightly Row (Folk Song) * Go Tell Aunt Rhody (Folk Song) * May Song (Folk Song) * Song of the Wind, (Folk Song) * O Come, Little Children (Folk Song) * Twinkle, Twinkle, Little Star Variations (Shinichi Suzuki) * Lightly Row (Folk Song) * Go Tell Aunt Rhody (Folk Song) * Chatter with the Angels (Spiritual) * Song of the Wind (Folk Song) * May Song (Folk Song) * French Folk Song (Folk Song) * O Come, Little Children (Folk Song) * Lament (Bohemian Folk Song) * Perpetual Motion (Shinichi Suzuki) * Allegretto (Shinichi Suzuki) * Allegro (Shinichi Suzuki) * The Little Fiddle (German Folk Song). Artist: Gary Karr, et al.